This panoramic was captured from the front of Potala Palace and is looking over Lhasa, Tibet. It is comprised of four RAW images processed in Photomatix, and then combined in Photoshop. For a view of Lhasa from the back of Potala Palace check out my previously posted panoramic. When the image loads in the lightbox, click and drag to view the entire panoramic. This is a response to the last panoramic i posted. 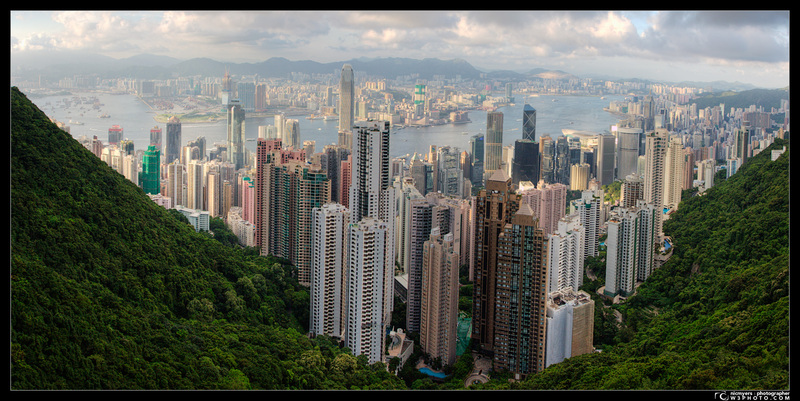 It is taken overlooking the Hong Kong skyline from the Kowloon side, opposite that of the previous one which was taken on the Hong Kong peak. I used a total of 3 horizontal shots from my 30D and Canon EF 17-40mm f/4L USM, it was combined in Photoshop CS3 using Photomerge. Be sure to view the larger one to get the full effect (1.08MB). I took this panoramic on my trip to Hong Kong in July. Converted to HDR in photomatix, and combined in Photoshop CS3 using Photomerge. I used a total of 2 shots from my 30D and Canon EF 17-40mm f/4L USM.